Happy Happy Tuesday!! Here we are - December 30th! Time for the very last SHOPPING OUR STASH challenge for 2014. This week's challenge is Thrice as Nice. The SOS crew wanna see THREE different design papers on your project this week. 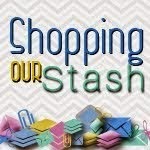 Visit the SHOPPING OUR STASH BLOG for all the details on the challenge and while you are there, please share some crafty lovin' with the rest of the SOS Crew. Oooh, well done! Love that strip of soldiers across the front. This would be a great card for a kid who's into toy soldiers. Awesome design! Man cards are so hard...but this one rocks! Fabulous man card, they are so hard to do. love the soldiers and yes we had them here when the boys were little. Dear jaw, please get up off the floor now. Seriously this is SOOO cool! Your eye for mixing and matching is spot on. Pinning this guy for future inspiration! Becca pretty much said it perfectly! Holy awesome sauce Batman, your guy card is without a doubt amazing!! 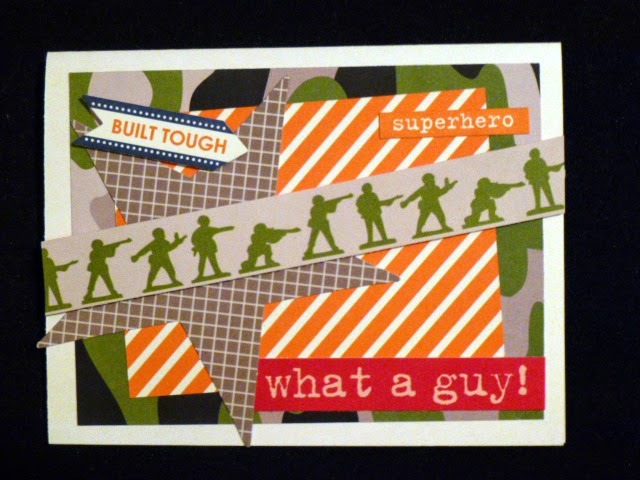 I quite love that you took a patterned paper challenge and made a guy card! Seems like most of the time, people go for CAS and no patterns for masculine cards. But this totally rocks! Wait, how is your black futon not actually black + Gordon patterned? This is completely fabulous, such a perfect mix of schtuff!